Day lilies are a lovely plant that is a nice addition to the landscape and they are just now starting to bloom in my garden. Growing daylily is easy. They are a very easy plant to grow, and can stand different kinds of soil and growing conditions. I have recently become attracted to the variey of colors and forms of day lilies. These are not the same ones my grandmother raised. Here are a few tips on how to grow daylilies. Day lilies love the sun and should have at least 6-8 hours of sun a day. However, many are tolerant of partial shade. Don’t plant under trees, as they may not get enough sun or will need to compete for nutrients and water. The exception is in very hot areas, where they can have some benefit from the shade. 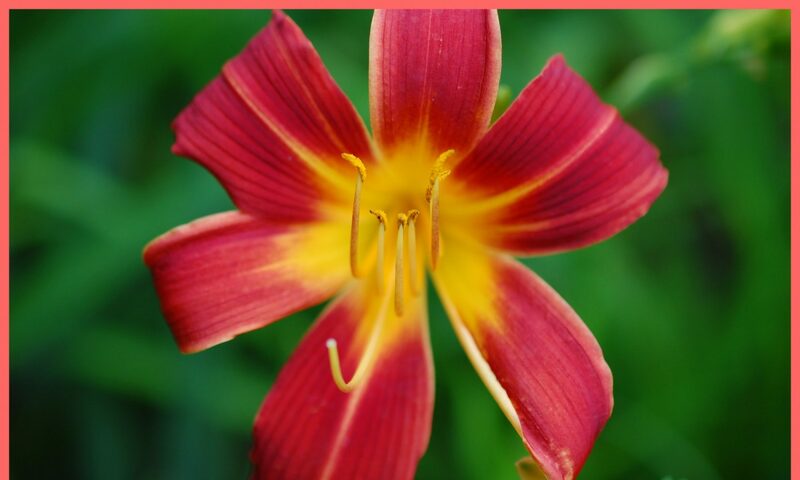 Day lilies are tolerant of a variety of soils and can tolerate either sand or clay soils as well as a range of pH. However, they will still benefit from the addition of organic matter to the soil. They should be placed in well drained beds. You should plant day lilies in the spring after danger of frost has passed or fall before frost sets in. You should work organic matter into the soil before planting. Plant your daylilies 12-30 inches apart, depending on how large your day lily spreads. Once established they need little care. However, in the beginning, they should be given fertilizer 10-10-10 or 6-12-12 once they have leafed out in spring and then in early fall. They should also be watered deeply and regularly in the beginning, especially when the buds are forming. Although day lilies can withstand drought, they do better with watering some otherwise the blooms may be smaller. You should apply an organic mulch to your day lilies as this will retain moisture in the soil. Beyond this, the only other things to worry about is controlling weeds and dead heading your day lilies and cutting down dry foliage in fall. Day lilies are not bothered by many pests. However some common pests are aphids, spider mites and slugs. For these, you can use recommended controls. Day lilies are a good addition to the home garden and I have started getting quite a few of them. I like the ones with unusual colors and ones that have a long bloom cycle. I need to concentrate on some of the smaller varieties, however, due to the limited space in my garden. I have managed to collect about 20 by now, and I recently bought 15 Stella D’Oro which is small and a reblooming daylily. I plan to use these to line one of my walkways. My favorite acquisition last year was a spider flowered day lily. It is getting buds this year. I can’t wait to see it blooming in the garden.